Reading residents Andrea Martinez (left) and Janelle Rasdeo are SNAP benefit recipients. They stand in line outside the St. James Chapel Church food bank Wednesday morning. Early data suggest people are not budgeting early February SNAP benefits as hoped. 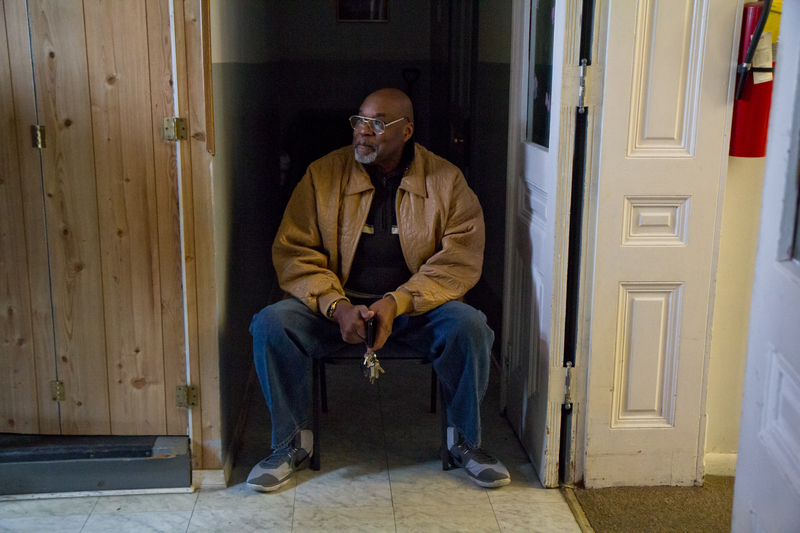 No place in Pennsylvania has more trouble keeping food on the table as Reading, Pennsylvania, a town of 88,000 about an hour outside of Philadelphia, where nearly half of all households receive food stamps, the highest rate in the state. That’s where Janelle Rosado waits. She receives about $300 a month in food stamps loaded onto a government-issued debit card to help feed herself and her three kids at home, but she still struggles to keep her family fed. Like everyone else in the line of about two dozen people, Rosado is quick to talk about the subject on her mind: the Supplemental Nutrition Assistance Program, also known as SNAP. Unless the longest government shutdown in U.S. history soon ends with a deal to reopen the government, Rosado is about to experience what it is like for the food assistance program to no longer be there for her. Federal officials say SNAP funding to states has now been thrown into limbo, with the nation’s 38 million recipients expected to start feeling pressure as soon as next month. Like many others in Pennsylvania’s poorest communities, Rosado is bracing herself for what might soon be a new reality. “What I did is stock my freezer with as much meat as I could, look for the best deals, like even the cheapest cans,” she said. Rosado used to work in cosmetology but lost her job years ago. Since then, she has taken temporary gigs around Reading and has been applying for full-time work, but she said it has been hard to come by. Rosado has a lot of company in Reading, formerly a coal and steel boomtown that, over the decades, has experienced the painful effects of deindustrialization. Federal figures show that today about 44 percent of households in Reading receive food stamps, making it one of the highest rates in the nation. Marilyn Ray is a retired insurance data processor who volunteers at St. James Chapel Church food bank. She performs intake on recipients before they receive their food. Inside the St. James Chapel Church of God, Marilyn Ray sits at a table as a volunteer, checking people in who come for bags for food. Retired and living off a fixed income, Ray is worried about her own adult daughter, who lives with her and uses SNAP benefits. If the shutdown drags on she is afraid the pantry’s lines will surge so much that they might deplete food supplies. In Harrisburg, the same question is being raised by Teresa Miller, secretary of the Pennsylvania Department of Human Services. “I’ve been anticipating that mid-February is when we might see the SNAP crisis,” Miller said. The federal government told Miller food stamps would have funding through February, but next month’s benefits were distributed early, which Miller says could pose a big problem. She hoped people would budget the benefits for two months. State officials mailed recipients letters informing them about this payment adjustment, but Miller said the letters may have puzzled some people. Early data suggest that people are not budgeting as hoped. Instead, she said state figures tracking SNAP recipients show that they are spending twice as much. That means starting in February, nearly 2 million Pennsylvania residents may be without food assistance. Miller said there’s no way the state can cover the gap. “It’s hundreds of millions of dollars a month in SNAP benefits. This is a lot of money that goes out the door. The state is not going to be able to step in and pay that kind of money in place of the federal government,” she said. 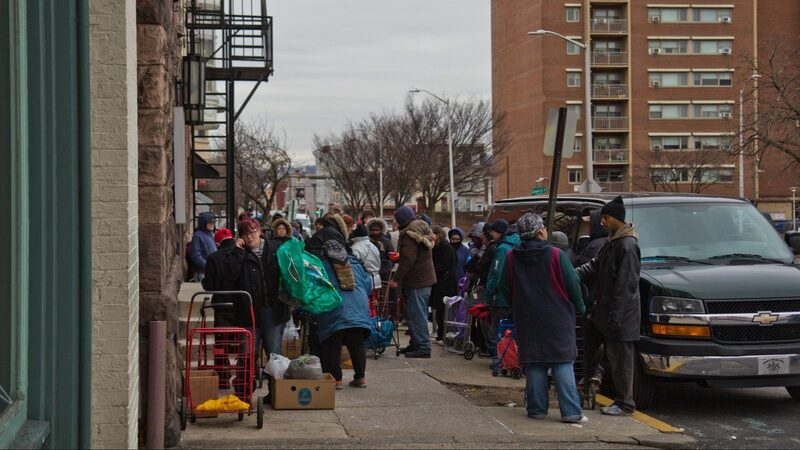 Residents of Reading, Pennsylvania wait in line at the St. James Chapel Church food bank. Four in households in Reading receive SNAP benefits. Now in its 33rd day, it is unclear when the partial government shutdown will be resolved, as Democrats in Washington and President Trump remain at odds over billions of dollars in funding for building a wall along the nation’s southwest border. Lowman Henry, with the Harrisburg-based Lincoln Institute of Public Opinion & Research, favors Trump’s side of the debate. He says supporters of the proposed border wall understand that the shutdown may require short term pain for many Americans. As the standoff continues, the Greater Berks Food Bank, which distributes some seven million pounds of food each year to hungry households in the region, is worried about its supply. The USDA says it is examining all options in trying to come up with an emergency plan. The agency reportedly has around $3 billion in a contingency fund but providing benefits to the country for just one month costs around $5 billion. All the crisis planning around feeding the country’s most in-need people has St. James pastor Steven McCracken feeling troubled. St. James Chapel Church Pastor Steven McCracken is worried about the already struggling members of his community in Reading, Pennsylvania. Marilyn Ray, the food bank volunteer, said she does not understand the need for the political drama. Ray, a retired insurance worker, grew up in Reading with a father who worked in steel factories and a mother who worked in dry cleaning. 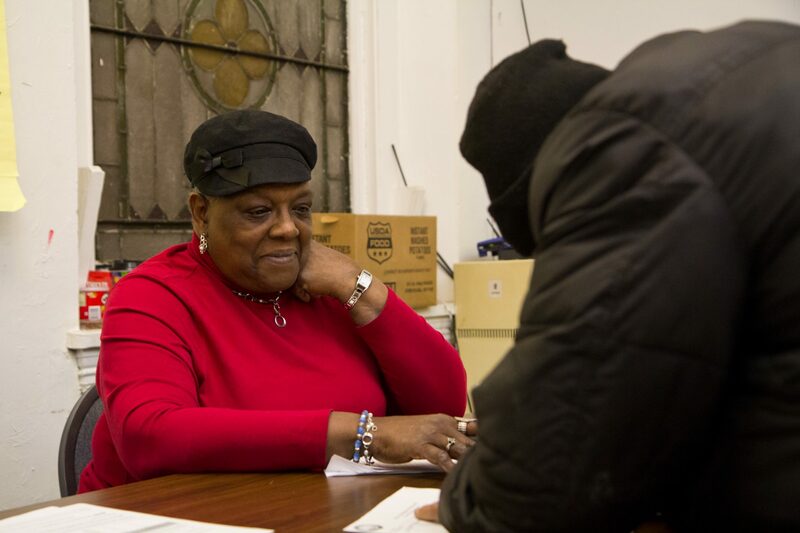 Life was sometimes paycheck-to-paycheck, and that experience has brought her a greater sense of dignity in wanting to help families who struggle to make ends meet. Ray says Washington would function better if politicians had a better understanding of places like Reading.